Lars von Trier’s 2006 film is unexpectedly and happily a comedy. True to the obstinate Dane’s fashion this film innovates by utilizing a computer editing process called Automavision. In the simplest terms, the camera was placed in a fixed position and the Automavision program decided when to zoom, pan and frame the action, entirely of it’s own accord. Due to this peculiar process the film looks terrible, for the program had no idea of proper framing or color continuity. The cuts are random, the actors move up and down, even out of the frame, the f-stops are way too high at times causing retina pain. Out of all of von Trier’s films this is the most accessible, you could recommend it to your parents without blushing, but he willfully caused it to look crappy to sass the audience. Lars interjects himself into the film at various points to narrate the story and comment upon the conventions of the comedy genre. He is first seen in a crane outside of an office building, with his reflection in the windows. He says, “Although you see my reflection, trust me, this film won’t be worth a moment’s reflection. It’s a comedy, and harmless as such. No preaching or swaying of opinion. Just a cozy time. So why not poke fun at artsy-fartsy culture?” Here the comedy starts, with the camera showing Kristoffer (Jens Albinus), an actor through a window of an office building. 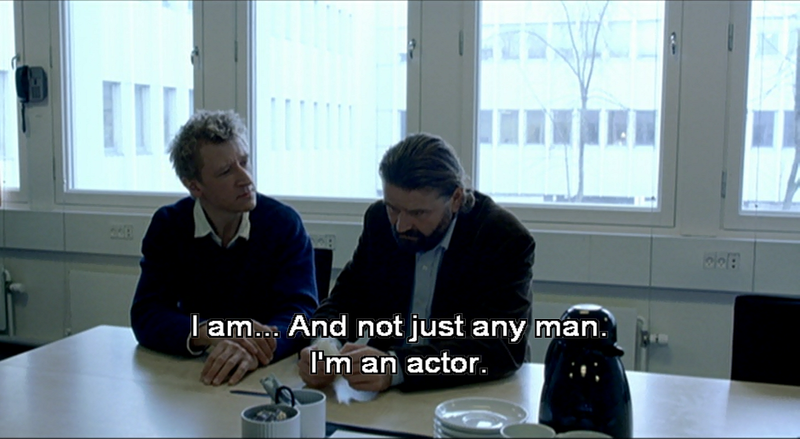 Lars’ narration describes him, “So here we have a self-important out-of-work actor, who, by miraculous chance, got a job. A very special job.” This is where von Trier starts to poke fun at the absurd proclivities of certain actors who ascribe to a method (Kristoffer is committed to the ideas of a fictional playwright Gambini, whose work is alluded to as being very modern, very ‘serious’) and also the directors who confuse them with no instruction but expect them to produce an engaging character regardless of that fact. The office staff in the film doubles as insufferable actors and the boss Ravn (Peter Gantzler) doubles as von Trier himself. Despite his assertion that the film is a “cozy time” the duel-leveled way in which the characters can be read makes this film much more than von Trier wants to admit. The conceit of this story is that Ravn, the boss of an I.T. company in Denmark, wants to sell to Icelandic investors but has come upon a snag. Ravn never had it in him to be the boss of a company; he hates rejection and doesn’t want to be the one who has to mete out disappointing news. His solution years previous was to invent a “boss of it all” who lives in the United States and gives his directives to Ravn to carry out. This way Ravn never has to be the bad guy; he is only the messenger. This ruse worked for years, as the employees would receive bogus emails composed by Ravn in the guise of the “boss” which basically convinced them that he existed, until he decided to sell. The potential buyers want to meet this elusive boss, who does not exist, so Ravn hires the actor Kristoffer to impersonate the boss to expedite the sale. With this decision the elaborate lies unravel and the comedy of errors ensues. The cast comprising the company are very funny, embracing their eccentric personalities and odd company dynamics. The company produces a vague I.T. product; the jargon of which is made fun of greatly. The difference between ‘outsourcing’ or ‘off-shoring’ are amusingly discussed as well as arguments about the true nature of what they actually do, which in never made clear. The corporate culture of inclusion and coddling are also made fun of. This is an office where hugs are routinely given out, rhyming songs are sung to make others feel better, and worker’s strange and volatile behavior is tolerated and even encouraged. Gorm (Casper Christensen) has a violent temper and when he starts to recite “Autumn in the country is muggy”, watch out because someone is getting a punch in the face. Mette (Louise Mieritz) is a basket case who screams repeatedly when the photocopier runs and cries several times a day. My personal favorite is Spencer (Jean-Marc Barr), an America who for some reason works at this company. Spencer’s problem is that he cannot speak Danish, no matter how much he practices, and he is openly ridiculed by his co-workers for his lack of language skills. He mangles the language repeatedly, yet refuses to converse in English; his naive optimism that he will speak Danish correctly or will be silent evermore is delightful. Compared to the bulk of von Trier’s other work this film will not stir furious debate, unless one rails against the poor visual quality of the picture. Though Lars contends that this is not an important feature; that we can go home “and with a clear conscience forget everything we’ve seen…” he still directed this for a reason. It reminds me of his assertion in The Five Obstructions that he hates cartoons and then he gleefully tells Jørgen Leth to produce a cartoon, just to be a nudge. 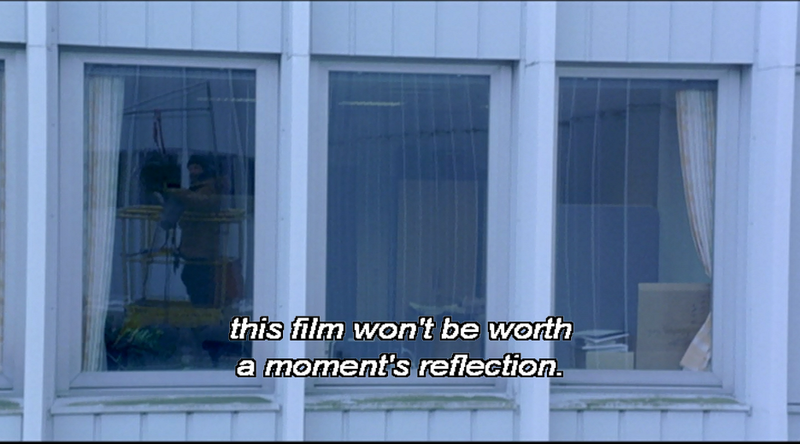 A conversation between Ravn and Kristoffer near the end of the film sums up the reason for this film existing. Ravn questions Kristoffer, “What do you hope to achieve?” To which Kristoffer replies, “Nothing. We’re just having fun.” It’s that simple, sometimes you just have to have a fun time and laugh.